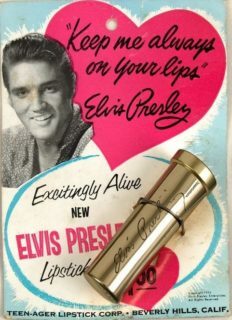 Elvis Presley Vintage Merchandise 1950s The most sought after Elvis Presley merchandise collectables and memorabilia are items that were produced in Elvis lifetime. 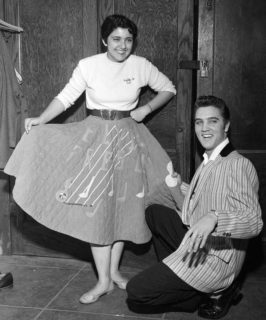 The rarest being Elvis mid 1950s items that includes, dolls, sneakers, teenage girl fashion, cosmetis and jewelry. 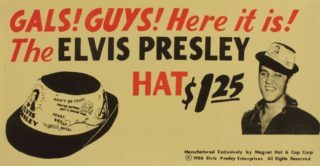 Elvis Presley Enterprises licensed several hats and scarves to take advantage of the fashions of the day. The head scarves, which were made of a blend of rayon and silk, featured a four-color print of Elvis. The largest scarves measured 32 inches square and cost under $2. 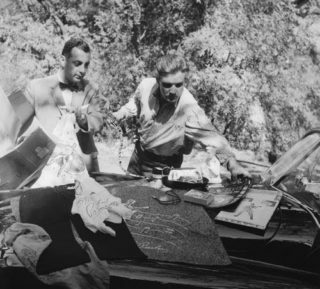 Women’s kerchiefs and hankies were also available. Elvis casual, crew hats became popular among teenage boys. Even Elvis was known to don one on occasion. Elvis Presley Enterprises sold two different styles of gabardine crew hats. Both featured titles of popular Elvis songs in the wide band around the crown. The more common style included a portrait of Elvis inside a yellow burst; the other showed a picture of Elvis clasping his hands by his face. The latter is currently higher in value, and both hats inflate in value if the original price tag is still attached. 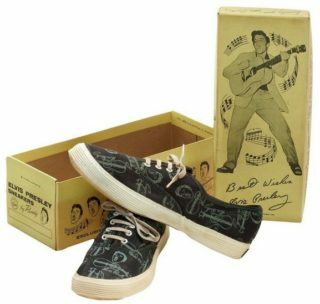 EPE licensed Randolph Manufacturing Company to produce Elvis canvas sneakers in 1956. The sneakers came in 2 different colors black or white pair. The black arethe most valuable, though sneakers in both colors are rare and highly sought collectibles. The tan-colored box that the sneakers came in featured a photo of Elvis on the front and the back. The photo on the front was a shot of Elvis performing, which was the famous pose used on his first album cover.